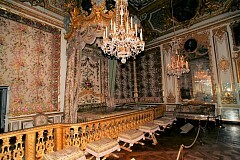 Château de Versailles or The Palace of Versailles began in 1624 as a royal hunting lodge. Here is the entrance to the tour. 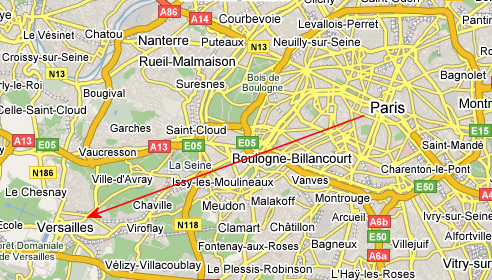 Because of my abortive expedition to Versailles the previous day, I made doubly sure of my train connections today. My mistake this day was not purchasing my ticket to Versailles at the RER ticket window. It seems one could buy entrance to major attractions this way, and I should have done it. 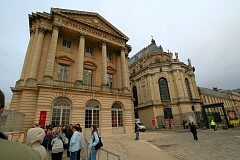 As it was, I arrived at 8 a.m. at the gates of Versailles and read a sign that said the tour opened at 9 a.m. - but so did the Versailles ticket window. That meant that while waiting first in line at the ticket window, I would later be way back in the line to enter. The whole purpose of my trip here today is to be first in line then quickly walk to the Hall of Mirrors to take pictures before tourists arrive. At about 8:30 an American got in line behind me. We decided I would go wait in the line to enter the Château while he remained first in line to get tickets. 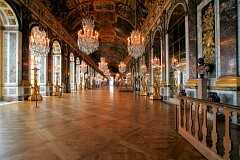 Our strategy worked, and I was able to quickly walk to the Hall of Mirrors. USA! USA! Interior stairway in the Château. There is an old myth that because the palace at Versailles did not have a single toilet, that occupants and guests would have to relieve themselves in the stairwells (in the smaller side-stairwells, not a grand stairwell like this). I'm sure people peed in out of the way places. But at the time they had "chaises pierces" that were decorated, high backed chairs with a potty hole for the chamber pot. The higher-ups got the honor of carrying the royal poo out to be examined each day. Doctors set great store about your health with your urine and poop. 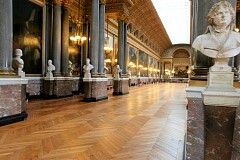 The Hall of Mirrors - look! No tourists! 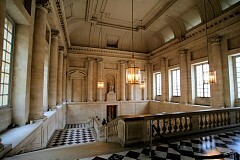 The hall has 3 million visitors a year. 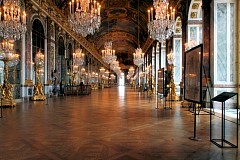 The ornate gallery has 357 mirrors stretching 60 yards and reflects light from 17 windows from which may be viewed Versailles' vast gardens. They won't let you use a camera flash when there is lots of painting on the wall. I set my camera on the edge of a pillar and chose the exposure priority setting and the camera took a long-exposure picture. 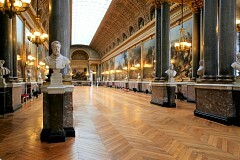 The reason the Hall of Mirrors was so impressive to the general public was that at that time, mirrors were usually made of polished metal-heavy, and not very clear. Then they started making glass mirrors in Venice that were much clearer and very expensive. Most people only had a small hand mirror (like in a powder compact) and only the very rich had a big mirror: a full length mirror was almost unheard of. So when they lined the whole gallery with mirrors that reflected the outside and made the room look even bigger, it was a marvel. When Marie Antoinette was imprisoned, they took her mirror away, to show her that looking at herself was no longer so important. A maid smuggled her a cardboard framed mirror in jail and it's still in the conciergerie museum. You don't get to visit most of the castle because it's too expensive to keep it up. Much of the original furnishings have been stolen, and they even know where lots of it is today, and when it becomes available, the government tries to buy it back. The Rockefellers and the Duponts gave lots of money to refurnish the castle. 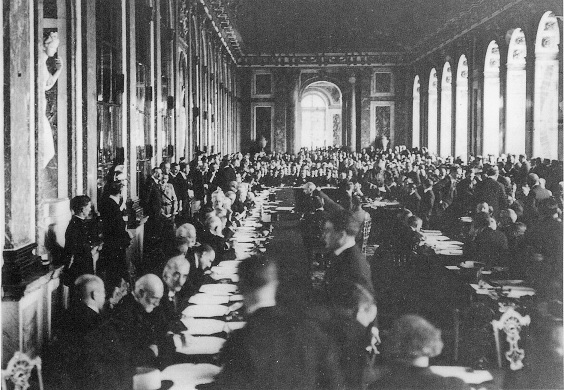 The Treaty of Versailles ending World War I was signed here on June 28, 1919. 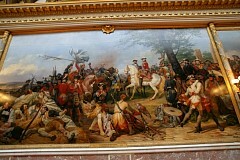 The German Empire was also proclaimed in the Hall of Mirrors after Germany defeated France in 1871. France demanded harshness toward a defeated Germany, mainly because it had suffered 1.3 million dead, 27 percent of all men between 18 and 27. Here I set the camera on its back and it snapped these pictures of the ceiling. 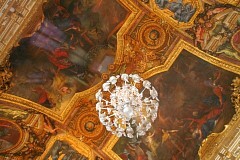 One of the main challenges was restoring Charles Le Brun's overhead paintings, which mark important moments in the reign of Louis XIV, the Sun King, who had the hall built as a monument to his own glory. This is the Queen's Chamber. The guide let me use the flash on my camera. Not the greatest pictures ... Nineteen royal children of France were born here, including the future Louis XV. Marie-Antoinette escaped from the rioting crowd on October 6, 1789 out the door under the hangings left of the bed. 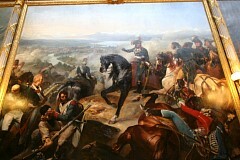 The rioters brought the royal family back to Paris, where a son died of illness and the king and queen were beheaded. Notice how short the beds are? It's because they had a superstition about laying down flat to sleep. They thought you could die from it, that it looked like you were laid out for burial, so they slept propped up on pillows. The Queen had apartments that the King had to be invited to come, and some courtiers had just a room or two, and some were the size of a modern house with many rooms. 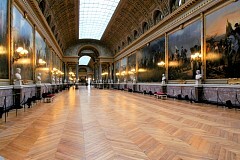 Here is the 380-foot-long Hall of Battles, with its 33 huge paintings recording French military victories from the Battle of Tolbiac in 496 to the Battle of Wagram in 1809. Look in the right-hand-corner of the picture on the far right below - that's seems like a little too-familiar embrace between those two dudes ... don't ask, don't tell? 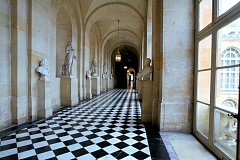 The corridor behind the Hall of Battles. I find the choice of floor patterning curious. It doesn't seem to fit in with the "old" surroundings.